​Glen Dimplex Ireland launched the new Zeroth Energy System at the annual SEAI Energy Show and was awarded the title Highly-Commended in the Best Renewable Product category at the Product of the Show Awards, which took place in the RDS on the 27th March 2019. The Zeroth Energy System offers an innovative new approach to heating and cooling city apartments in multi-occupancy residential buildings. Zeroth creates comfortable temperature within apartments and reduces overheating in communal areas - both common challenges modern apartment block builders need to address in their designs. 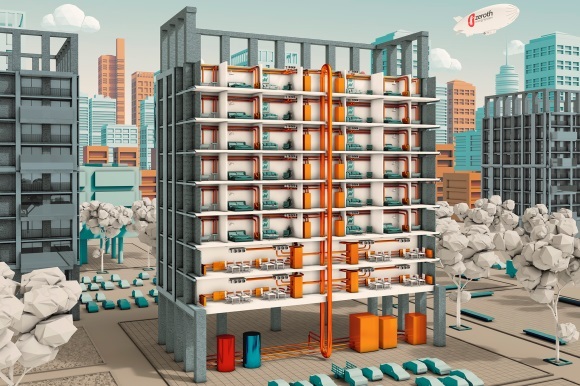 By creating a series of ‘energy loops’ within a building, the Zeroth Energy System replaces conventional high temperature systems with a cool, low pressure system, maintained by the building’s central plant room. Low temperature water flows around the building’s main loop to each apartment, which have their own ‘mini loop’, where an individual heat pump produces heated or chilled water to the desired temperature. The water can then be passed to fan coils which deliver warm or cold air into a room through vents in the ceiling or wall, or to underfloor heating, smart electrical or fan-assisted wet radiators. What is more, the cost of heating system losses is no longer spread across all residents meaning they only pay for the heating or cooling they use. The SEAI Energy Show Product of the Show Awards have championed innovative product developments, especially those incorporating smart energy solutions. The Best Renewable Energy Product category awards companies offering energy services who have demonstrated advances being made to improve the efficiency and performance of their energy offering. To find out more about Zeroth, contact us on +353 1 842 4833 or email salesireland@glendimplex.com.